Gizmo the guinea pig is an evil genius, and he is not happy about the new blended family arrangement. Elliot, his human servant, has been asked to share Gizmo with Jasmine, who likes to dress Gizmo in sparkly outfits. This is, obviously, humiliating, and Gizmo will have his revenge. Worse, Jasmine has a large brown monster called a dog. Wedgie is thrilled to meet Gizmo. And Elliot. And everybody! Wedgie's pretty much all about the love. Can't they all just get along? This was an adorable book that would make a great mentor text to show students how to examine different perspectives about events and issues in an accessible way. 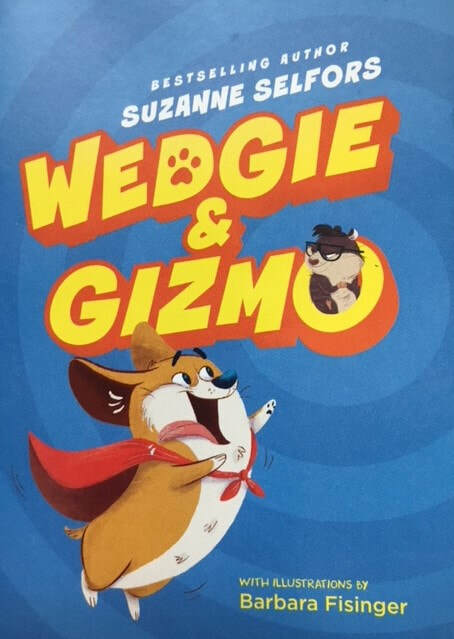 Wedgie and Gizmo's differences are straightforward, but the layer of differences between Elliot's attitudes about their new family and Jasmine's also provide opportunities to make inferences, find supporting evidence, and talk about why and how people can view the same incident so differently. It's also good to examine how authors change tone and word choice to express different moods for the different characters through the alternating viewpoints. "Super Wedgie reporting for duty. Elliot stands next to me. He smells like socks and syrup. I LOVE socks and syrup! And even though Elliot is new to my pack, I LOVE Elliot."